This website is linked to the book 'United for Life'. A unique book which shows you the divine principles about marriage, divorce and remarriage. There is also an Dutch version available. For more information you can visit the Dutch website. At the bottom of this page you will find some reader comments. If you want to order 'United for Life' click here. 'United for Life' is an indispensable recource for anyone desiring to know what the scriptures teach about divorce and remarriage! May the Lord use this book to open many blind eyes and deaf ears to the truth of His Word regarding this most important issue facing the Church and the world today! This book is very captivating from start to finish, and it's thrilling to know the Lord will use it to set many captives free!! If it even saves one soul it will have been worth it, but I'm sure it will bear much fruit! After his forestry education and job as a ranger, Willem Lingeman has been a criminal investigator for the last seventeen years. He has been working with the central government of the Netherlands for over 40 years, upholding nature en (international) nature conservation laws. Willem is a member of the Board for the International Shell Museum 'Creature Shell Foundation' at Utrecht (the Netherlands). Together with his wife and their son he makes and hosts several programmes on local radio stations. The Gospel message is the central theme. To order 'United for Life' click here. The book will be sent to you within a few days after the receipt of the purchase price and shipping costs. member of the Dutch parliament for the Christian Union, by mrs. Henriëtte Schreuders, daughter of Willem and Helen Lingeman. 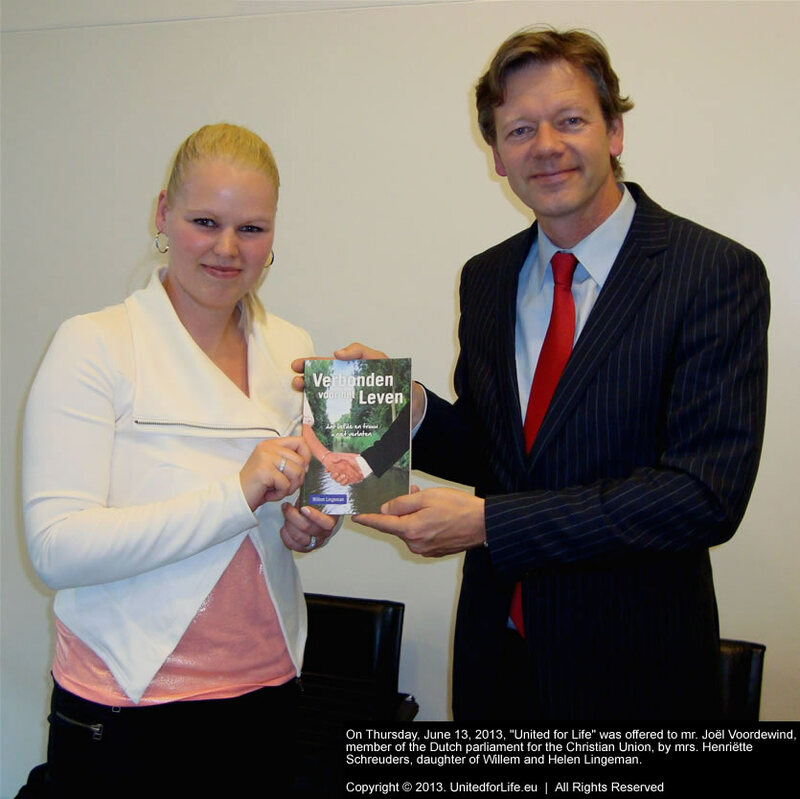 On Tuesday, June 15, 2015, 'United for Life', was presented to mr. Kees van der Staaij, member of the Dutch parliament for the Reformed Protestant Party (Staatkundig Gereformeerde Partij SGP). More information about 'United for Life' click here. *The contact page will help you receive additional information, free of any obligations. Some reactions from readers worldwide. For reasons of privacy no names are mentioned. Copyright © 2015. Verbondenvoorhetleven.nl| All Rights Reserved.